Difference between revisions of "Abadeer Taasii"
" Power, in all of it's many forms, is to be sought out. Once obtained, it is to be used to be held on to and never let go. " ― Abadeer Taasii, 34 ABY. Abadeer was born on the planet of Shili. He was born into a clan of hunters. He was born outside the city of Korunaan, the old capital of Shili. Now abandoned and ruined it is home to some of the wilder tribes of the Togruta. The Taasii tribe hunts akul for a living and they are quite good at it. They hunt akul both alive and dead. Dead for their own people who prize the teeth for the own jewelry and the like. Off worlders prize the akul for zoos and to keep as savage pets. All Togruta are very sensitive to the world around them because of their montrals which give them a passive form of echolocation. Abadeer was especially sensitive to the world around him, for he was Force sensitive. In the Togruta culture this isn’t always the easiest thing to realize as Togruta are so sensitive and connected to nature as is. He was able to sense danger and prey before anyone else in the hunting parties. He was highly desired to be brought in many hunting trips and parties. As he grew Abadeer started to gain a sense that he was able to touch into a power greater then himself. One major tradition among the Taasii tribe is that of single combat. Whether martial arts or weapon combat, Abadeer enjoyed and participated in all of it. He would train every moment of the day that he was not hunting to learn to fight with a sword, and to perfect his form of Broken Gate martial arts. Once Abadeer was full grown he started to challenge anyone and everyone. 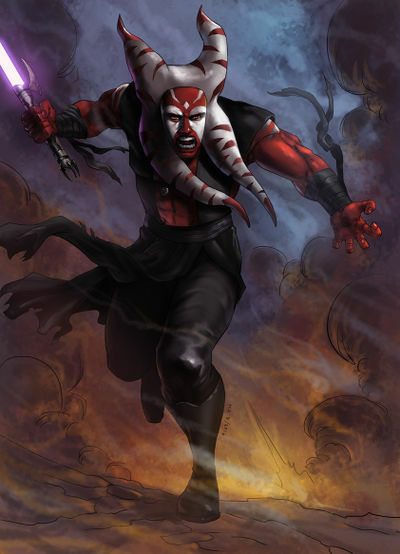 When Abadeer was 20 he had challenged a Togruta named Salash, and he killed him. It was not purposeful but it was the beginning of a decent into the Dark for Abadeer. He found that even though he’d know the man, he didn’t mind having killed him. It fueled him with power. Abadeer continued to challenge fellow tribe members and would kill them in their combat trials. At the age of 23 he was banished from the Taasii tribe for descending to far into darkness. Abadeer went off into the wilder jungles of Shili to live on his own for 2 years. He honed his hunting skills against the akul and various other predators from Shili. He was looking to collect enough product to buy a ticket off world from one of the many mining groups that went back and forth through the Shili system. Abadeer kept only one thing for himself, a single akul tooth that he wears on a string around his neck. 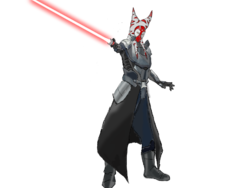 Once Abadeer had killed and gathered enough akul to get a ticket off world he started looking for someone or something to help him train his abilities in the Dark Side of the Force. He was dropped off in Coruscant where he made his way to the Imperial Palace. It was in ruins and any valuables were long gone. He just felt a connection the Force there and was drawn to it. As he entered the incredible condensation of pure Force energy racked him with visions of a system, the Antei system where he felt he could be trained. He left the Jedi temple Coruscant with a clear drive and goal in mind. He would find a trainer and he would begin his formal training in the Force. Abadeer’s only goal is to seek after power, to be stronger than any around and he knew that this Dark Brotherhood would be exactly where he could gain what he needed. Abadeer is a tall male with muscular features. At the top of his head he measures 1.8 meters, and his montrals measure to 2.1. His base skin color is a dark red and white stripes. He has large white reverse tear drop shape patches of each eye. 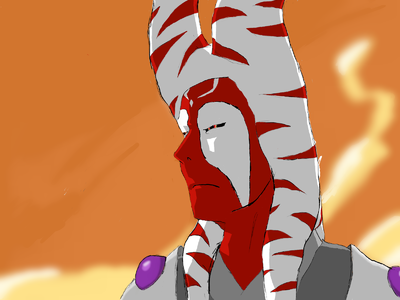 His montrals and lekku are white with the same dark red stripes. He has several scars of varying sizes over his body. He has angular facial features that can make him attractive to most, with a cocky look quite often that can turn to a terrifying, feral scowl when in battle. He wears a dark loose robe. It is cut off at the shoulders. Black bandages wrap his hands and forearms. The top exposes the center of his torso down to his naval. The bottom of the robe has some draping bits of cloth, with loose flexible pants and dark leather boots. When in battle he removes the top of the robe and lets it hang around his waist. Taasii likes to keep his equipment very simple. He has use for one lightsaber and that's what he keeps on his person at all times. He's not fond of blasters as they don't allow him the chance he feels to test his prowess against an opponent. Taasii is prideful, but not without reason. He is a talented fighter from a race of beings who are warriors at heart. He only cares for power, and using that power to gain more power. Not necessarily political power but he desires for personal power so that he could say any person he came in contact with, he would be able to defeat in combat. He is not overly cruel except in combat where he is ruthless. He will challenge just about anyone and everyone to a fight. For as aggressive as he his, he's not a stupid brute. He is quite intelligent in fact. He has a keen knack for analysis for situations. This is a common trait in individuals who spend their whole life fighting. He can assess a situation for the best route for his best possible outcome. He's not always keen to talk as he finds many words are wasted. He is blunt and honest because he finds no use in lying to some to gain what he wants when a quick jab of his lightsaber could do it so much faster. 34 ABY - 35 ABY "TBA"
This page was last modified on 20 January 2019, at 19:42.